✟ Щ (Known sometimes as ‘Harry’ but for some reason he had previously been referred to as ‘Henry’). Formerly 9079 Y & L Regt, 5580 Pte E Coy 1 Bn Argyll & Sutherland Highlanders (Princess Louise’s). He was in India in 1911 where he served 5 years (listed as ‘Fearne’). 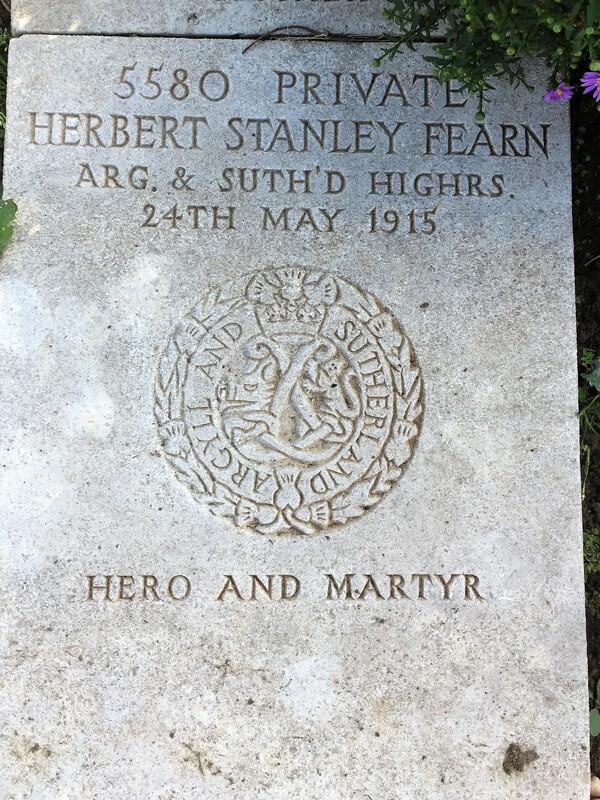 He died at No 13 General Hospital, Boulogne on 24/5/1915 of wounds received at Ypres on 8 May, age 25. Grave; Boulogne Eastern Cemetery. 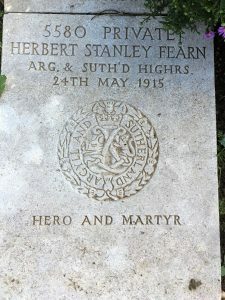 (D.C. 5/6/1915; ‘Herbert Stanley Fearn of Primrose Cottage, Station Road, Hathersage, has succumbed to wounds received in active service. Mrs Georgina Fearn, on hearing the news that her son had been wounded, immediately left Hathersage for the hospital at Boulogne and remained with her son until his death. He was quite conscious up to the last. He was buried in the cemetery adjacent to the hospital, and his mother was present at the interment’). b 1890 in Ecclesfield, 1901C age 11 living at Parsons Cross Road, Wadsley Bridge, and 1911C at Roslyn Crescent, Hathersage. Son of the late John Fearn, file grinder, (native of Wadsley Bridge, Sheffield) and Georgina Moore, b 1860, Sheffield. Brother of FEARN, Percy Theodore. Following the death of their father in 1905 Herbert joined the Army, his two sisters Violet Rebecca and Jane Winifred lived with their Aunt Annie Moore, spinster b 1857, at Station Road, Hathersage (1911C). Mother Georgina died at Sheffield in 1936.